The Saugatuck/Douglas area is a resort community on Lake Michigan full of art galleries, restaurants, boutiques, and antique stores. This 1860's boarding house in downtown Douglas has been completely restored making four condominium units, each with its own unique charm, including hardwood floors, tile bathroom, granite countertops, all new appliances, washer/dryer and central air. The condos are located minutes from the Douglas beach. This Unit #4 is located on the First Floor with a screened-in porch. King bed in bedroom, sleeper sofa in living room to sleep 4 total. upon booking, you will receive an email packet with all the instructions you need for your rental. The reservation is only secured when the rental fee is paid and the rental contract is signed (including the credit card for our files on the last page.) you will only get the code for the lock when we receive the completed rental agreement. All guests are expected to leave the property as they found it, this includes washing all dishes, linens used, removing all garbage, food and other items not on the property when you arrived. anyone failing to comply will be assessed a charge for cleaning. no persons not on the contract are permitted on the premises or to use the pool/patio/hottub area. failure to follow this rule will result in immediate dismissal from the property without refund. Great family gathering place . Very kid friendly! The pool is great for young kids .. mattresses need to be replaced with new..
We enjoyed our stay very much. 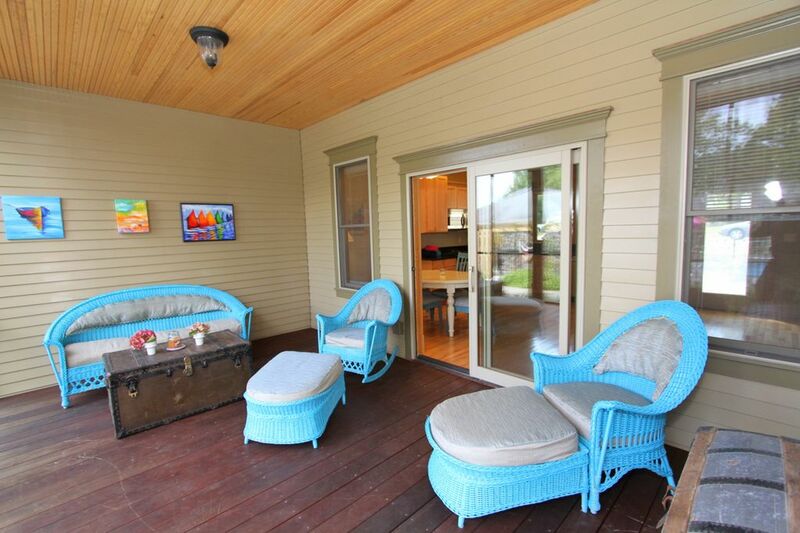 Loved the screened in porch! Condo is very clean and remodeled very nicely. The only complaint we would have, is the mattress is very soft. Kitchen is equipped with basic cooking utensils. Great appliances to cook on. Pool and hot tub area is very clean and more than enough chairs around the patio. We will book this condo again next time we are in the area. These condos would be great for multiple families traveling together or an extended family. I bet this place looked great when its renovations were completed in 2007. I'm guessing that's when the pictures were taken, too. I will give credit to Sarah being very friendly over email and on the phone, but keep searching. With this place having a for sale sign in the yard ($1.5M!!!) and a completely overgrown yard/garden, the initial impression it made when we pulled up was bad. Once we got inside and lived in it for 3 days, it was worse. - The dishwasher isn't attached to anything and falls all over you if you pull out the racks, which is something one commonly does with dishwashers. - There are light bulbs out in every room. - There is zero space for luggage in the bedroom because there's an enormous, heavy, arched-top, empty trunk serving no purpose there. - The WiFi never worked at all while we were there, and LTE service was slow on all of our devices (we have AT&T phones, a T-Mobile iPad and a Verizon work phone...all were bad in this town), so having no WiFi meant we couldn't stream music or watch Netflix. Owners "adjusted" (i.e., looked at/moved an inch) the booster that takes a signal from 100' away in the adjacent cabin and tries to boost it into a huge old house. Doesn't work, needless to say. - Half the jets in the hot tub don't work, and the display is broken, so you just have to hit buttons until things happen. We couldn't ever get in the pool because it's small and other guests used it all day every day. - We brought a bunch of food to cook (because it had a beautiful kitchen in the pictures, and we love to cook), but there were 4 plastic spatulas and three dollar store steak knives as for kitchen utensils. No joke. Yes, there are pots and pans and dishes, but seriously unusable if you do anything other than microwave something. Plus the kitchen was dirty. Being that guests have to clean the unit themselves (and do all the laundering of towels and sheets while still checking out by 10am! ), it appears that previous tenants weren't terribly contentious about cleaning. I left it cleaner than I found it because I have some courtesy. As the cherry on top, it was way too costly per night. This is clearly a high maintenance money pit for the owners. We extended our stay in Douglas another night but stayed at another property that was half the cost and much more enjoyable. Our new favorite place to stay in Michigan! We will absolutely return for another stay at these condos later in the fall. Charmingly remodeled, very clean, and super comfortable. Quiet at night! We hung out by the pool, which is kept REALLY clean and at a comfortable temperature. We cooked most of our own evening meals, and could easily walk to breakfast or lunch and the shops & galleries when we felt like it. We appreciated the washer/dryer, and the extra towels. We are runners, and it was so easy to figure out a route along Lakeshore Drive leaving from our front door. Thanks for everything Sarah! I spent the long weekend with my family we rented unit 1 and 4. Wow the woodwork and the condition of the unit is so unique and makes you feel extra special. The whole weekend we spent at the pool and it was warm and refreshing. The owners took extra care every morning or night picking up and cleaning it before we were even out of bed. The caretaker met us and ask if we needed anything at least once a day, The charm and walking distance to everything makes Vintage Views special for our family, we plan on all meeting there again next year.